Adjustable console mount with tilt swivel. A ProClip with a face plate that tilts and swivels and that is adjustable to suit the height of the console in a number of vehicles. 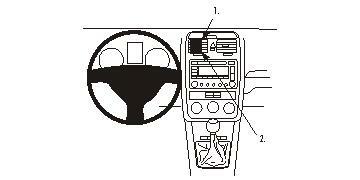 In most vehicles it is placed on the right side of the console. The ProClip has been tested to fit perfectly in the listed car models. 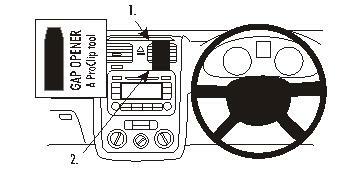 (If you are installing the ProClip in an unlisted car model, it is important not to block the air bag.) Comes with detailed instructions. This headrest mount fits a number of vehicles, some of them are listed below. Are you missing a model? 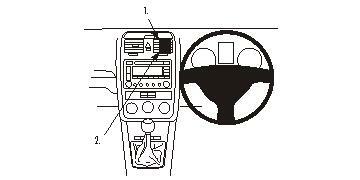 Measure the headrest in your vehicle, if it matches the measurements below this product will fit in your car. 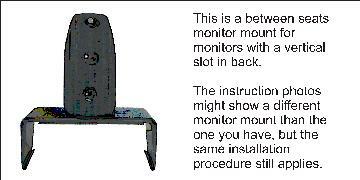 Mount for monitors with a vertical slot in back. For installation of multimedia screens in vehicles. The screen mount is placed between the front seats, giving the back seat passengers a perfect view. The screen mount comes with a tilt swivel so it can be adjusted in order to avoid light reflection. You can take the screen with you when leaving the vehicle. Installation is quick and easy. 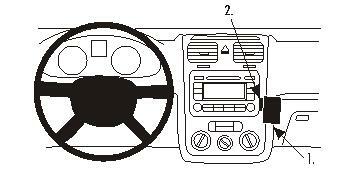 The interior of the vehicle will not be damaged, as no drilling holes is required. The screen mount fits screens with a vertical slot on the back side.